According to TMR, the global cloud data center ITAD stood at US$3.5 bn in 2015. The steady rise in the ITAD uptake and the revenue generated by these solutions is likely to boost the market’s opportunity to reach US$4.6 bn by 2020. Data sanitization has emerged as the highest demanded ITAD solution among all in the recent times. In 2015, the segment generated a revenue of US$1.4 bn, which is likely to reach US$1.9 bn by 2020, expanding at a CAGR of 6.40% between 2016 and 2020. The rising preference for secure elimination of data in enterprises has created a substantial need for data sanitization in order to protect confidential information while disposing of storage assets, which is projected to increase significantly in the coming years. As enterprises are increasingly opting for recovery services in order to maximize the revenue generated from old and discarded IT assets, the demand for asset recovery solutions is expected to augment remarkably in the near future. The segment is projected to rise at a CAGR of 6.30% during the period from 2016 to 2020, emerging second in the overall market by 2020. 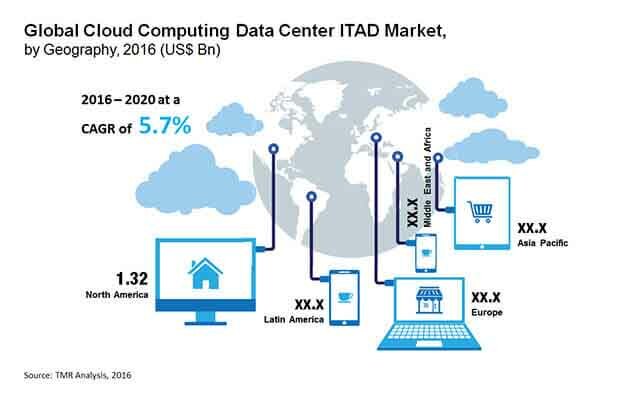 The global market for cloud computing data center ITAD spreads across North America, Latin America, Europe, Asia Pacific, and the Middle East and Africa. Currently, North America dominates this market on account of the increased need for secure disposition of discarded IT assets, collected due to the frequent upgradation of technologies in this region. In 2015, the opportunity in this market stood at US$1.3 bn in terms of revenue. Expanding at a CAGR of 5.90% during the period from 2016 to 2020, the market is expected to reach US$1.74 Bn by the end of 2020. The augmented reliance on outsourced data hosting and processing, propelled by the increasing number of multi-tenant data centers (MTDC) in this region, is projected to boost the adoption of ITAD solution significantly in North America over the next few years. Asia Pacific has also been projected to register a steady rise in the adoption of ITAD and cloud data centers in view of the ongoing surge in the cloud computing industry and increased uptake of cloud services in this region. The increasing investments by cloud service providers in this region add substantially to the cause. Asset Management Ireland Ltd., Iron Mountain Recycling LLC, CloudBlue Technologies Inc., eRecoEMEA Corp. Ltd., Apto Solutions, Arrow Electronics Inc., es-Amm, Sims Recycling, ITRenew Inc. are the major cloud computing data center ITAD solution providers across the world. The global cloud computing data center IT asset disposition (ITAD) market report delivers analysis for the period from 2012 to 2020, where the period from 2016 to 2020 is the forecast period and 2015 is considered as the base year and data from 2012 to 2014 has been incorporated as historical information. The report provides benchmarking of major cloud computing service (CCS) providers and also highlights the key trends and technologies playing a major role in the expansion of cloud computing data center ITAD market over the forecast period. Benchmarking parameters included in this report give a clear understanding of the various ITAD programs and practices followed by the leading CCS providers. The report also contains region-wise analysis of the cloud data center ITAD market and outlines different data sanitization and disposition guidelines adopted by key CCS providers. The report segments the cloud computing data center ITAD market by asset type and by solution. The market by asset type is further divided into IT equipment and support infrastructure. IT equipment segment is further classified into servers, storages, network gears, cables, and racks. Moreover, the support infrastructure segment includes physical security systems, environmental controls, and uninterruptable power sources (UPS). By solution, the market is subdivided into data sanitization, recovery, and recycling. The report also provides a quantitative analysis of assets resold versus assets recycled as well as the type of business model and their revenue share practices adopted between the key CCS providers and their ITAD vendors. A comprehensive qualitative analysis of the environmental sustainability practices is also provided in the report. The report also highlights the outlook on market growth, in terms of revenue (in US$ Bn) during the forecast period, with respect to various geographies including North America, Europe, Asia Pacific, MEA, and Latin America.